Osprey Lines Ltd. operates luxurious, fast ferry service between the islands of Grenada, Carriacou and Petite Martinique in the Caribbean. 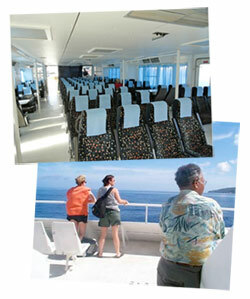 Enjoy the sundeck or sit in plush air-conditioned comfort. You'll be amazed at the breathtaking scenery along the way. Our ferries are the most convenient and time saving way to travel to Carriacou and Petite Martinique - we will save you hours in travel time each way! We offer a range of services from shuttling passengers in keeping with tight schedules, to arranging charters for the movement of passengers and offshore supply services.